We came across this giraffe last week while on a game drive, and everyone was immediately mesmerised by its horns. Or lack thereof. While not entirely uncommon, it’s also not an everyday occurrence that we see a giraffe with only one horn. A broken horn can be due to a number of things. Males use their horns while sparring with other males in order to establish mating dominance. The result is often a broken horn. Damage can also occur when these long-legged beauties connect with branches when running from predators. And sometimes they get injured when they are born. Giraffe babies have a fair way to fall when they arrive in the world, as their mothers give birth standing up. Giraffe horns differ from other ungulates in that they are covered in hair and skin, as opposed to keratin. They are also present from birth, unlike other horned mammals whose horns only arrive when the animal is older. The horns of a newborn giraffe are made of cartilage and not yet attached to the skull. As it grows older, the cartilage is replaced with bone and fused to the skull through a process known as ossification. This is why the correct term for giraffe horns is ossicones. The ossicones are what distinguishes the male and female from one another. 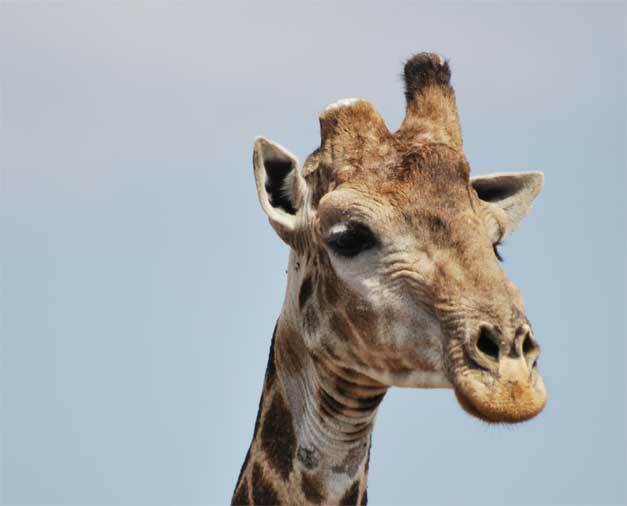 Stereotypically, the female giraffe has tufts of hair on the top of her horns, while the males are bald on top. Some males develop calcium deposits on top of their heads, which creates the illusion of the animal having more than two horns. The result is somewhat unsightly, but can be used to good effect when fighting as they add weight to the skull. But regardless of whether or not its missing an ossicone, the giraffe will always remain one of the world’s most beautiful animals.